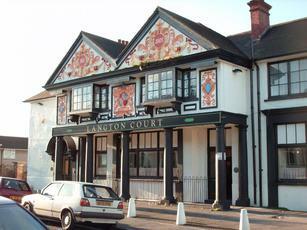 Locally known as the Klondyke, the pub was purpose built in 1902 on the site of the former Langton Court House, part of which is still standing beyond the car park and is now a residential property. The main bar has a false ceiling and the Terrazzo floor was carpeted over many years ago. With a function room and skittle alley, this is one of the largest pubs in the area and the only one in St. Anne's. To the rear is a decked area for smokers and to the side, the Car Park. Beer-wise, there’s currently Fuller's London Pride and Butcombe Bitter and the usual keg offerings. The Lounge is popular with local Clubs and Associations and other local groups like the guitar club meet in the skittle alley. There is a ladies darts team that plays on a Thursday evening. There's occasional Live Music and/or discos too. The pub is currently on the market with Star Pubs & Bars after the last long serving tenant left after nineteen years. For the last eighteen months, a holding relief manager has been running the pub. A new manager will be taking over soon. Recently went on the market and currently being run by a holding relief couple. Real ales @ £3.20. Live music or Karaoke on Saturday nights. Crib Tuesdays, Pool Wednesdays and Ladies Darts Thursdays. Bingo in the Skittle Alley Friday evenings. A traditional and large U-shaped pub in the middle of a residential street, it was good to see it quite busy on a recent Thursday evening visit with most of the tables taken, although it is in a densely populated neighbourhood and there are few other pubs around, so it is perhaps unsurprising even in the current climate. The main bar area is across the front of the pub and is of a conventional design that has probably not changed much in decades. The larger area to the left is more of a lounge bar with carpeted floor, mustard colour paintwork and a few small beams on the ceiling. A plasma was mounted on the wall at one end showing the golf, but the volume was low and this was not too intrusive. There were a few colonial style circular fans on the ceiling and the wood panelled bar counter had red velvet inlays. A smaller rear bar was off of the lounge. To the right is more of a public bar area, although this just flowed from the lounge rather than being a separate room. The colour scheme here was a pale blue and the area was dominated by a pool table with some exceptionally bright illumination above it. There was another plasmas on the wall although this was not in use, perhaps because of the ladies darts match that was in progress. A notice board detailed forthcoming skittles fixtures, and there was a large cabinet with plenty of trophies in, suggesting that the pub teams have some success in the local leagues. The only beer on tap was Theakston’s Best although there was a second pump that had a Courage clip reversed. The solitary cider was Blackthorn, although they were also pouring pints of Natch from plastic bottles – always the sign of a proper Bristol boozer! In reply to the below comment as the Landlord of these premises we are duty bound by our license. If RtB would like to see this he is more than welcome. As it states that we have a 1 o'clock license but NO new cusomers are allowed in after 11pm. As the pub is in the middle of a housing estate the neighbours did not want drunk people arriving at the pub in taxi's and wake them up so this is why the Bristol City Council gave us these rules as part of the license which also states that no one is allowed tto smoke outside after 11pm So this is why the dsoors get closed at this time. I contacted this pub during the week to find out the time at which it closed on a Saturday night. Over the telephone I was told that the pub closed at 1am, and indeed the sign on the pub door stated that last orders were called at 12.30pm. However, when three friends and I - having previously been for a drink at the Bloomfield Inn - arrived at Langton Court at 11.03pm, we were turned away by an incredibly rude woman who stated that she wasn't letting anybody else in, as she didn't want the pub to "fill up with drunk people from the town". Leaving aside the fact that there are any number of late-opening pubs 'in town' and so it seems unlikely that anybody who's been out drinking in town would trek to St Anne's for a late drink, we certainly were not 'drunk people' and would not have been described as such by any impartial bystander. On reflection, if this woman's attitude is typical of that of the staff of this pub, we were probably fortunate not to be allowed in. Avoid at all costs.